Brunei is home to one of the world’s most biologically diverse ecosystems. Its capital city, Bandar Seri Begawan, is in a rainforest near Kedayan and the Brunei River. The master planning team collaborated with biologists, environmental specialists and engineers – and, most importantly, the people and government of Brunei – to develop sustainable strategies. The Kedayan River connects the international airport to the city center and Kampong Ayer, Brunei’s first water town. The eco-corridor along the river was first designed as a green infrastructure to manage frequent flooding in the city center. Through stakeholder meetings, the initiative grew to encompass tourism and regeneration. The design refocuses development along the rivers, creating an active waterfront for recreation, leisure and cultural activities. At the same time, the design connects new commercial nodes that will reactivate development along the river. A boundary policy restricts growth outside of the currently developed area to prevent future urban sprawl. This encourages redevelopment and improves land efficiency while preserving the forests and open spaces. Together with recreation and leisure programs, the creation of better-planned open spaces along the waterfront of Kedayan and the Brunei River helps Brunei recall its natural assets. While renewing the condition of Bandar Seri Begawan’s existing infrastructure, the plan provides a clear vision for improving the livability of the city, driving economic diversification and demonstrating ways to embrace public input in national planning. Led by HOK, the master planning team included Jones Lang LaSalle, Meinhardt, MVA and Brunei firm OWMP International. 39 sq. mi. / 100 sq. km. HOK’s 2035 master plan for Bandar Seri Begawan in Brunei looks to biomimicry and the city’s original water-driven form for inspiration. Visit the Bandar Seri Begawan Master Plan website. 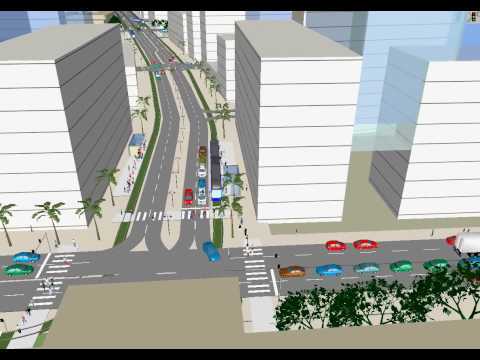 Explore the Bandar Seri Begawan master plan’s proposed light rail transit system in this video simulation.